The Swedish glass industry dates back to the 1500s, using the country's rich sources of most of the natural raw materials to make glass, as well as fuel in the form of large forests. In 1830, Eda Glasbruk, (Eda Glass Works) was established near Emterud in the Värmland province of western Sweden, close to the border with Norway. 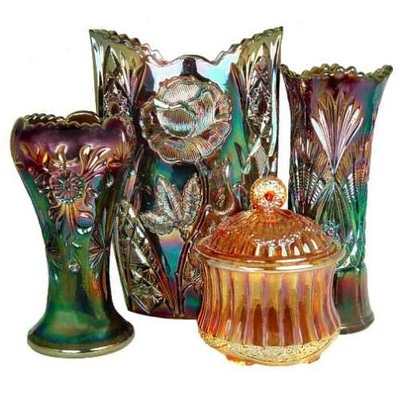 Carnival Glass of astonishing beauty was produced there, in fairly small quantities, during the 1920s. 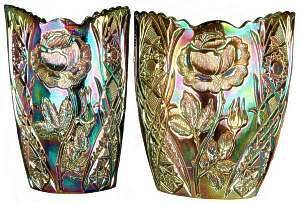 The colours used by Eda for their Carnival Glass were mainly marigold and blue, but there are also rarer colours that are found far less often: pink, purple (in light and dark shades) and iridised pearl milk glass. Eda catalogues are known and most patterns produced by the company are now a matter of record. 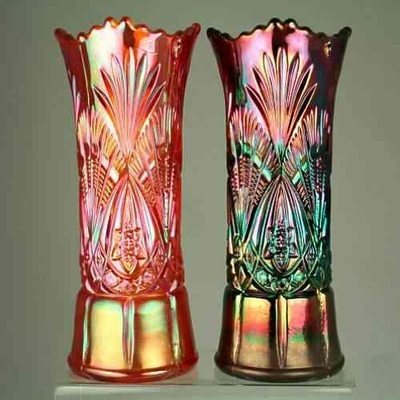 A catalogue of Coloured Glass was produced in 1925 that covered the main designs made by Eda in Carnival Glass. It is acknowledged, however, that Eda made a number of other patterns in Carnival that were not shown in the Coloured Glass catalogue, but were instead part of their other lines shown in their main pattern books. Sadly, Carnival Glass production at Eda was shortlived. The rich designs and colours of Eda’s wonderful Carnival was curtailed and ceased by 1930. In 1933 the works closed completely. The pressed glass shop at Eda in the 1920s, courtesy Eda Glass Collectors. 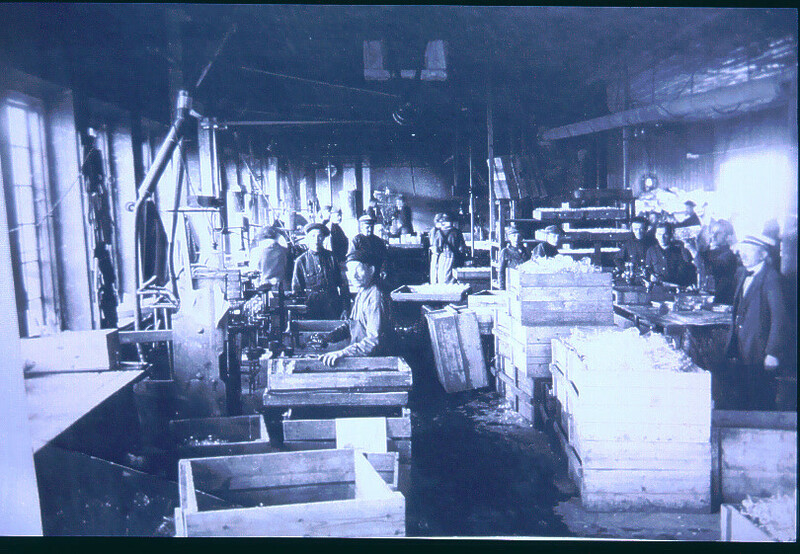 The packing room at Eda in the 1920s, courtesy Eda Glass Collectors. The display, above right, clearly shows the range and beauty of Eda's Carnival Glass. The pieces are (left to right), Tusenskona vase with cupped-in top, blue; large size Rose Garden oval vase (sometimes called a "letter" vase), blue; Lagerkrans lidded bonbonniere, marigold; Dagny vase, blue. We have researched, studied, documented and photographed Eda's Carnival Glass over many years. The result is an e-book that provides the most comprehensive coverage of the Carnival Glass made by Eda (as well as Elme, Fåglaviks and Hovmantorps), all in one easy-to-use e-book. Check it out, along with our other e-books and Carnival Glass publications. You can buy online with Paypal and download your "Carnival Glass from Sweden" e-book, or have it mailed to you on a CD.